"Money is fungible, Judge Robert Smith declared during the oral argument on the Atlantic Yards eminent domain case October 14 at the Court of Appeals in Albany. His point was that $100 million in state subsidies for arena infrastructure made it easier for Forest City Ratner to build the rest of the project. Empire State Development Corporation attorney Philip Karmel responded with a verbal shrug. But the issue deserves more attention. That's why the Community Benefits Agreement (CBA) signatories were in Albany, proxies for the project and better for p.r. than a Forest City Ratner executive. Forest City Ratner is spending a couple of million dollars on the CBA, first on direct payments to organizations with no other visible means of support. We did. Money is fungible. Well, of course, we didn't pay for it directly or necessarily in full, and it's not on the books. However, public dollars--some $305 million in direct subsidies, plus tax breaks, below-market land, and more--have given Forest City Ratner the flexibility to shift money around. More? How about--to pick one of the latest examples--a speed-up in the last $25 million state funding as part of an amendment to allow that money to be used--in contradiction of the original agreement--to pay the developer's "soft costs," such as design and engineering. Once upon a time, Forest City Ratner paid its own soft costs. But--let's think aloud--paying those soft costs left it short on cash, cash needed to pay those CBA organizations, cash needed to help fund Delia Hunley-Adossa and Charlene Nimmons so they could work on a 35th District City Council campaign (ultimately with 2013 in mind?) without having to find other day jobs. Now the state's going to pay those soft costs. That leaves more cash for FCR. See how it works? Money is fungible. The CBA membership is comprised of local leaders who love their neighborhood and have their fingers on the pulse of the needs of the community's most vulnerable--children and senior citizens. The CBA believes local organizations should be involved in the land-use planning process and that quantifiable benefits for the community should be identified as part of the planning process. That's a lot of pulse-taking, but what does it mean? Could it refer to the "intergenerational center" that the Rev. Herbert Daughtry so often touts, scheduled to be built in Phase 2 of the project, which could take 25 years. At the state Senate oversight hearing on May 5/29/09, longtime community planner Ron Shiffman said minority hiring and contracting and affordable housing “should be part of public policy” rather than part of a CBA because it “allows the developer to literally buy” support for the project. Rather, there should be a level playing field. Was that simply a minority view from a member of the Develop Don't Destroy Brooklyn board? Not really. 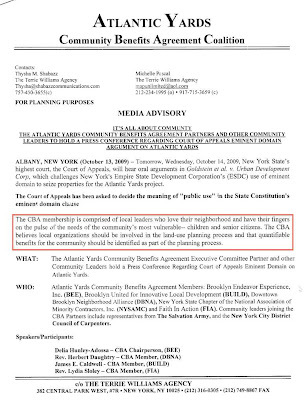 After all, Mayor Mike Bloomberg is "violently opposed" to CBAs. But he still hasn't repudiated the AY CBA, nor his role as a witness--nor the city press release that inaccurately claimed he was a signatory. And it's taxpayer funds--whether via direct city subsidy or other means--that have helped the developer "to literally buy" support for the project.